AminoA Gro meets Aminogram standardisation requirements and contains only fully absorbable L-α type amino acids. AminoA Gro releases and reinforces different reactions in the plant's metabolism. Its mode of action has a similar effect to that of plant hormones and natural growth regulators. AminoA Gro has also a significant nutritional value which complements the main bio-stimulant effect. AminoA Gro is rich in fulvic acid which acts to stimulate root development and also, due to its low molecular weight, enhances the uptake of amino-acids by the plant. Apply AminoA Gro when the crop is at its most active: at transplanting, flowering, formation and ripening of fruit. It is also advisable to apply in stressful situations. AminoA Gro should not be mixed with herbicides whose mode of action is the disrupt the amino-acid chain or that are known to be harsh on the crop. 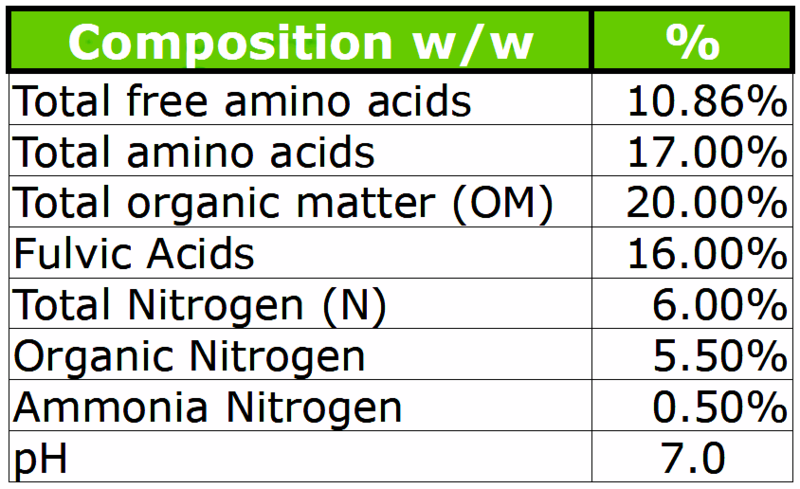 Do not apply in Tank Mixtures with herbicides and growth regulators at a dose rate of more than 1 litre ha. AminoA Gro is, generally, compatible with fungicides and insecticides BUT it is recommended to carry out a simple jar compatibility test first. The above information and recommendations have been obtained from extensive studies and tests. However, given that many factors beyond our control may have an effect during application, the Company only guarantees composition and formulation and will not accept liability for any damage or lack of efficacy arising from non-observance (total or partial) of the instructions given on this label. Heavy metal content below the limits authorized for this classification. Store in a cool, dry place in the sealed container. Non-corrosive, non-irritant. Keep out of children reach. Keep away from food, drinks and animal feed. Packed as 2 x 10L or 20 litre containers. AminoA Gro is a Biostimulant with a high concentration of amino acids, obtained from enzymatic hydrolysis and fulvic acid. It can be used on all crops, including: vegetables, olive trees, fruit trees, citrus trees, vineyards, banana plantations, gardens, ornamental plants and lawns. It is particularly rich in the amino-acids L-Alanine,L-Glutamic and L-Glycine which influence chlorophyll development ,the development of young leaves and form chelates with micro-nutrients. It also contains a significant levels of L-Proline which is a component of cell osmosis and can help the plant reduce hydric loss in stressful weather conditions. Both of heat and cold. AminoA Gro is made from 100% Active Ingredients without any fillers or inert materials. 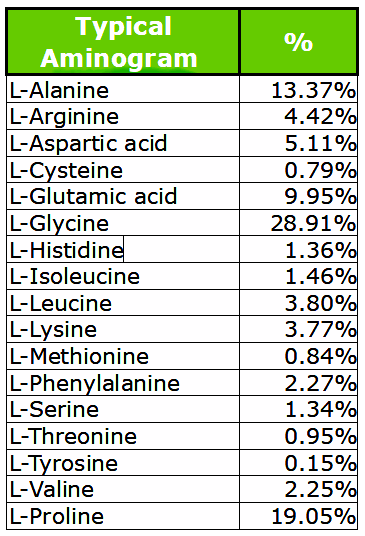 100% of the Amino Acids found in AminoA Gro are the L-type (L-levogiro). AminoA Gro also contains 20% organic matter, 6% N (Nitrogen), 17% Amino acids (10.86 % free) and 16% fulvic acid. AminoA Gro releases and reinforces different reactions in plant metabolism, its biostimulant action having a similar effect to that of plant hormones and natural growth regulators, as well as acting as a traditional nutrient. AminoA Gro is manufactured by a major company to AminoA Ltd specifications. AminoA Gro is a unique product intended to meet the most demanding needs of the nutrient and biostimulant sector. Strengthens plant development (leaves and buds). Stimulates the blossom, formation and growth of the fruit. Facilitates and increases nutrient absorption from the soil and foliage. Promotes earlier and more uniform fruit ripening. Promotes assimilation of calcium in the cells. Extends fruit preservation after harvest. Stimulates chlorophyll synthesis and metabolism in the formation of growth hormones. It is also a precursor of fruit aromas and flavours. Stimulates root growth and also takes part in chlorophil synthesis. Precursor of polyamides that activate cell multiplication. Essential in cases of phosphorus deficiency (as shown by Rabe & Lowatt 1904) and in deficiences of other elements such as Magnezium (Mg), Potassium (K), Calcium (Ca), Manganese (Mn), and Zink (Zn). Very common in the soil. Involved in the formation of Nitrogen reserves. Improves pollen germination, activates development of growth tissues (meristems). Stimulates growth of young leaves. Provides resistance in stress situations, enhances photosynthesis and chlorophyll synthesis. Takes part in chlorophyll synthesis and has a chelating effect. Involved in the formation of young leaves. Deficiency can impair root development. Together with Glutamic Acid, it is the most commonly found amino acid in woody tissues, branches and shoots and in olive leaves. Assists photosynthesis, chlorophyll synthesis and stoma opening. Vital link in ethylene synthesis, wich improve fruit ripening. A significant influence in root development. Precursor of lignin, a component of wood and the woody parts of plants. Regulates water balance and takes part in chlorophill synthesis. Improves plants resistance to adverse situations. Plays an important role in photosynthesis. In chloroplasts (photosystem II), it acts as an electron donor in the reduction of oxidized chlorophyll. Together with other compounds, it is present in olive branches and leaves. Gives resistance to plants in stress situations. As a component of cell osmosis in plants, it causes decrease in hydric losses during drought, improves moisture content of biopolymers and acts as an energy source, increasing the resistance of plants exposed to these conditions. Protects against cold, drought or excess salt stress by strengthening cell walls. Improves pollen germination and fertility. Regulates cell wall metabolism and water by regulating cell osmosis. Consequently, it is important in conditions of drought and extremely high or low temperatures (Steward, Aspinall & Paleg 1981).